Electropolishing is an electrochemical process by which surface material is removed by anodic dissolution. Electropolishing removes surface material, beginning with the high points within the microscopic surface texture. 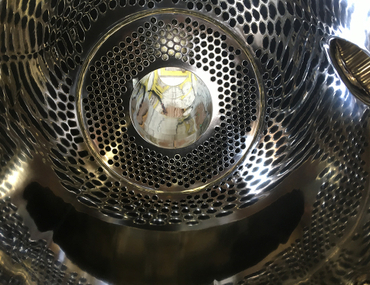 By removing these points, the electropolishing process will improve the surface finish of a metal such as stainless steel, nickel, aluminum and hastelloy, leaving a smoother and more reflective surface. The benefit of electropolishing is that it delivers a smoother, more reflective surface that reduces product adhesion and improves surface cleanability. Perhaps more importantly, electropolishing preferentially dissolves free iron, inclusions, and embedded particles from the surface of the work-piece. This process improves the near surface chemistry of the material and promotes the formation of an improved corrosion resistant surface layer. Harrison Electropolishing is a leading provider of electropolishing services for industrial and high purity industries. Since our opening in 1980 we have continually worked to expand and improve our services. 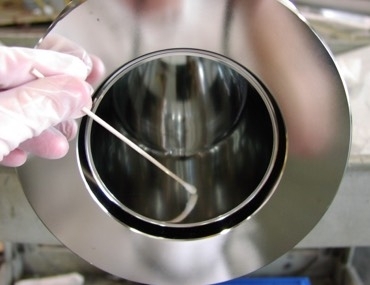 Today, with over 50 employees and expanded operating hours, Harrison Electropolishing is well suited to provide electropolish services for a multitude of industries. Electropolishing is accomplished by creating an electrochemical cell in which the material to be polished is charged anodically. A cathode is formed to mirror the geometry of the work-surface and the two are submerged in a heated electrolyte bath. When a DC current is applied, the electrical charge forces metal ions to be dissolved from the stainless steel work-surface. 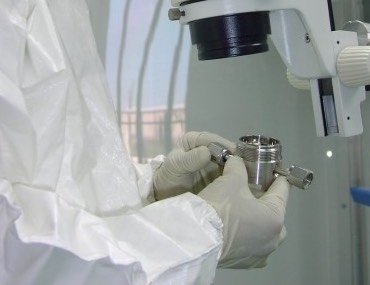 Depending on the runtime of the electropolishing process and the dimensional tolerances of the component to be electropolished, the amount of material that can be removed ranges from 0.0003” to 0.003”. The key to the electropolishing process is the difference in current density across the surface. Within the microscopic surface profile, the current density is greater at the high points and lesser at the low points. The rate of the electropolishing reaction is directly proportional to the current density. 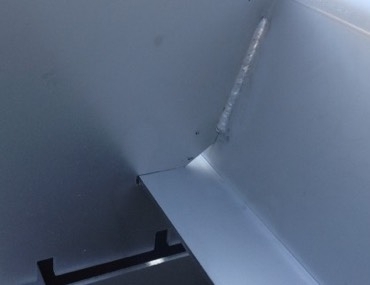 The increased current density at the raised points forces the metal to dissolve faster at these points and thus tends to level the surface material. After the electropolishing treatment, the work-piece is passed through a series of steps to neutralize, rinse, clean and dry the surfaces. Learn more about some of the benefits of electropolishing. 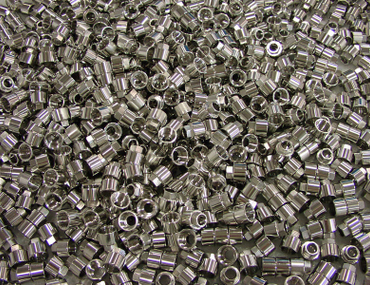 Stainless steel combines desirable mechanical properties with a known and proven level of corrosion resistance. 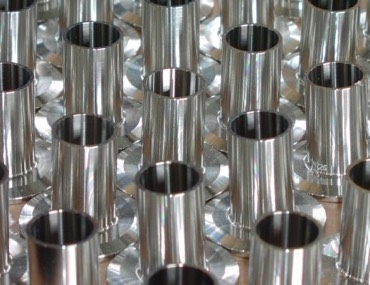 Nickel alloys, including Hastelloy, Inconel and Monel require special consideration when electropolishing. Aluminum can be divided into two major categories: wrought and casting alloys. Electropolishing Hastelloy can reverse the adverse effects of degradation by real world fabricating and handling operations. ASME-BPE is the leading Standard on how to design and build equipment and systems used in the production of biopharmaceuticals. 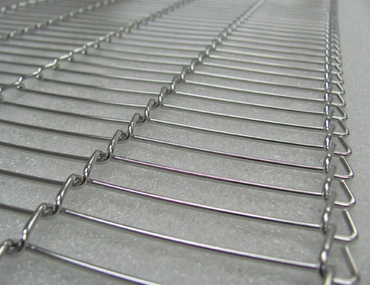 Harrison Electropolishing has developed and assembled a continuous polishing system capable of electropolishing stainless steel conveyor belts. 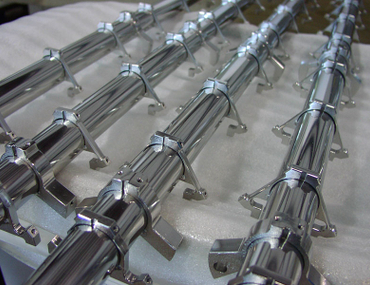 View our portfolio of electropolishing work.